"ordinary heroes of America's Greatest Generation"
To help build public interest and involvement in the events and activities various organizations are planning to commemorate the 75th anniversaries of the major events of WWII, the members of the Spirit of '45 coalition are inviting the public to help create a "Wall of Honor" made up of the photos of the American men and women who served in uniform during the war. 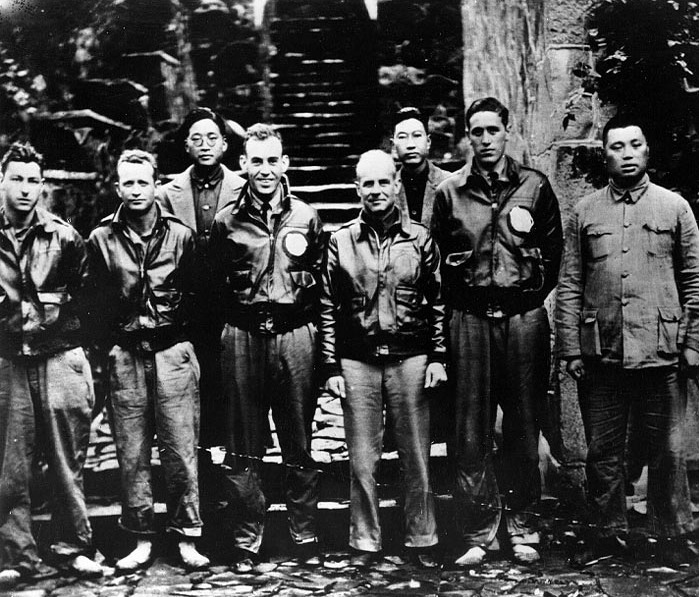 The goal of this ambitious project is to find the individual photos of the hundreds of thousands whose names that appear on head stones, memorials, and in public records throughout America by creating a giant Wall of Honor that will be displayed on the National Mall on the 75th anniversary of the end of WWII in August - September 2020, after which it will be taken on a 50-state tour (pending the necessary funding), and displayed each year in the nation's capitol on Spirit of '45 Day. Putting the "legs" into "legacy"
To have your photo included in the 75th Anniversary Wall of Honor, email it as a high resolution JPEG attachment (300 DPI or better), with the name, branch of service, theater (Europe, Pacific, China Burma India), home town (please include zip code) to Info@Spiritof45.org. Donations of $45 or more to help support the project are warmly welcomed and will be acknowledged in the Community Partner Roll Call that will be published each year in August on Spirit of '45 Day. One of the highest priorities of the WWII 75th Anniversary Wall of Honor project is to collect the photos of the more than 400,000 who made the ultimate sacrifice who are represented by the wall of Gold Stars at the National World War II Memorial in Washington, D.C. 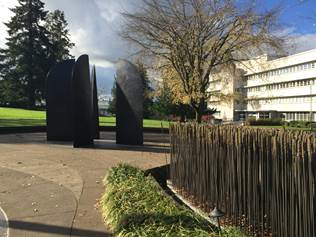 These include the 93,221 who are buried - and the 55,863 who were MIA whose names are etched in memorials - in the WWII cemeteries in Europe, North Africa, the Philippines and the U.S. that are administered by the American Battle Monuments Commission which is creating WWII curriculum with the help of National History Day which has a special program that honors those who fell at Omaha Beach during the invasion of Normandy. 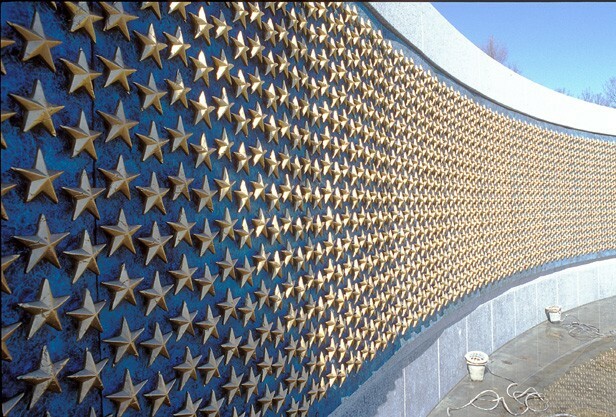 Wall of Gold Stars at the National WWII Memorial. 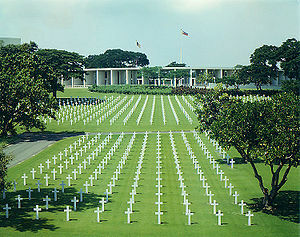 American WWII cemetery in Manila, Philippines. Spirit of '45 is exploring ways to connect the schools and communities of these fallen heroes with youth groups in the countries where they are buried, such as the "Faces of Margraten" that is collecting photos of the Americans who are buried in the American cemeteries in the Netherlands and Belgium. 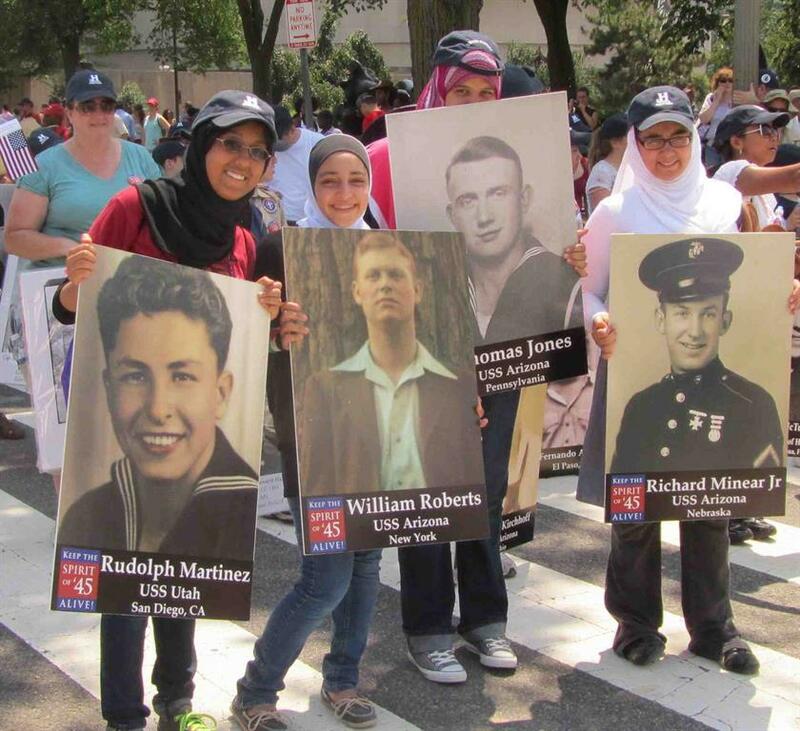 To help promote public awareness about this aspect of the Project, 400 Spirit of '45 youth volunteers march in the National Memorial Day Parade in Washington, DC each year, carrying the photos of a cross section of the men and women who made the ultimate sacrifice in WWII, including all posthumous recipients of the Congressional Medal of Honor. 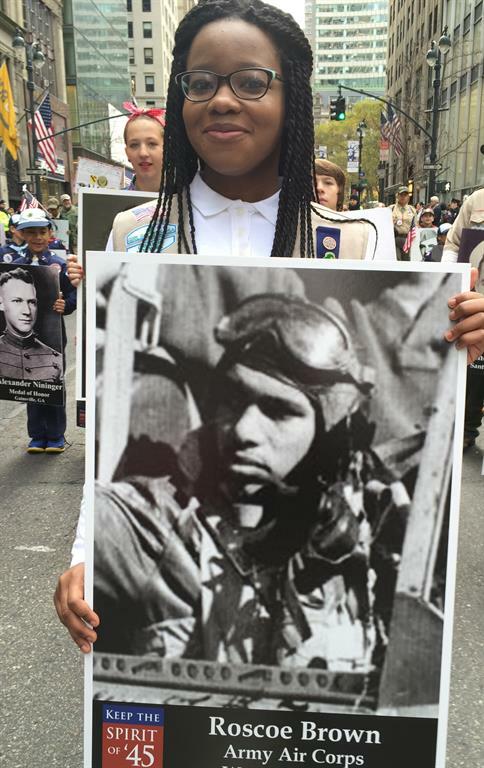 Capt.Jerry Yellin marches down Constitution Avenue with youth volunteer carrying photo of his wingman Phil Schlamberg, who was KIA on the day the two of them flew the final combat mission of WWII on August 14, 1945. Yellin was the Honorary Grand Marshal of the National Memorial Day Parade in 2014 and 2014, and makes numerous public appearances and speeches on behalf of Spirit of '45 Day throughout the year. The first photos that will be placed in the Wall archives are those of the more than 2,000 who lost their lives during the December 7, 1941 attack on Pearl Harbor - America's first Gold Stars of WWII. 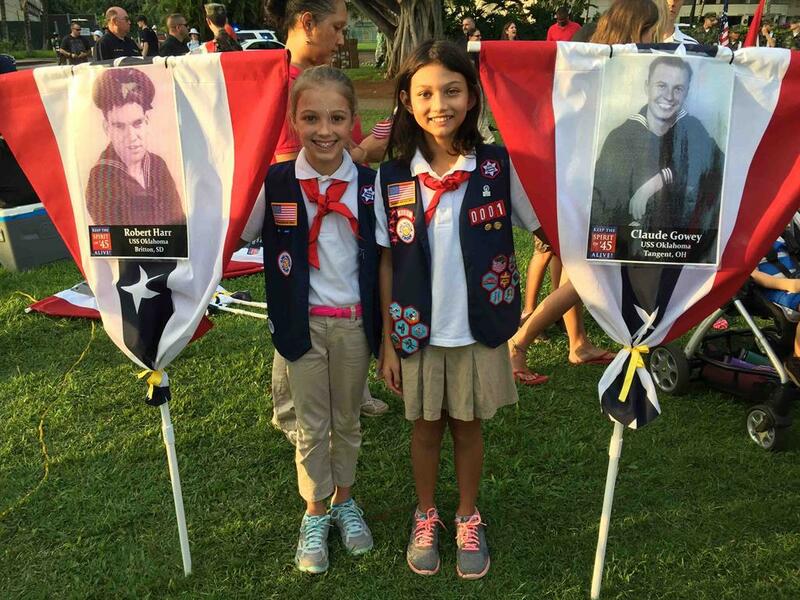 These photos will be carried by youth volunteers in the National Day Parade in Honolulu, HI as part of the Pearl Harbor 75th Anniversary Commemoration on December 7, 2016. "Remember, and be inspired!" - Youth volunteer preparing to march with photos of the fallen in Pearl Harbor Day Parade and National Memorial Day Parade. 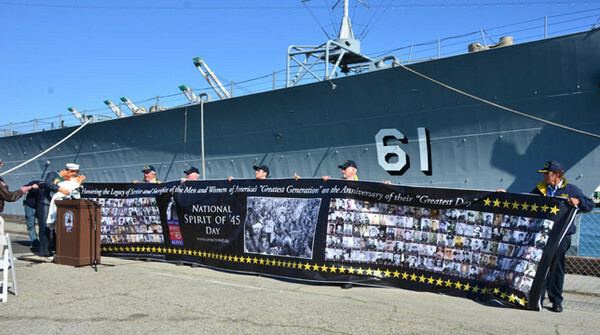 The members of the Spirit of '45 coalition are identifying organizations in each state that can be the point of contact for helping promote the collection of the photos of the WWII veterans from their community so that they can be displayed on the second weekend in August, and then added to the archive for the national Wall that will be unveiled in August 2020. 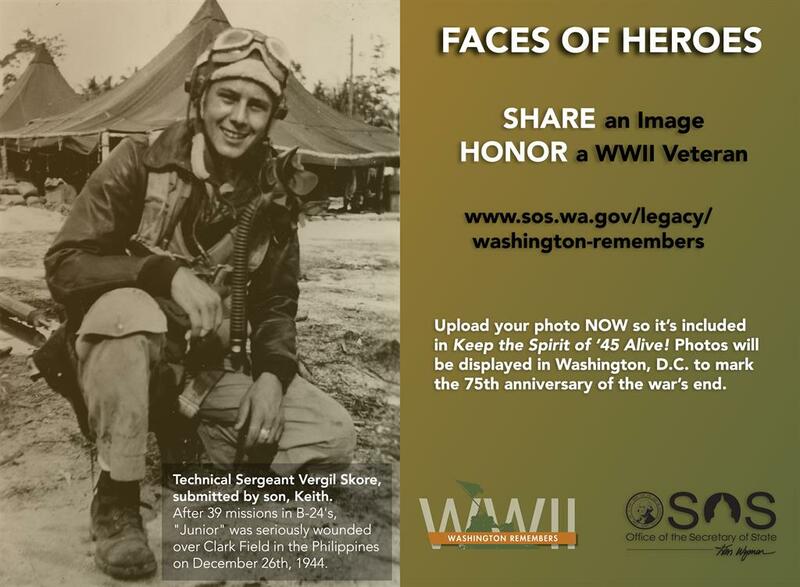 Washington State is collecting photos of its WWII veterans as an extension of its highly successful 70th Anniversary project "Washington Remembers - Faces of Heroes" so that they can be displayed each year at the state's WWII Memorial on the grounds of the capitol building in Olympia. 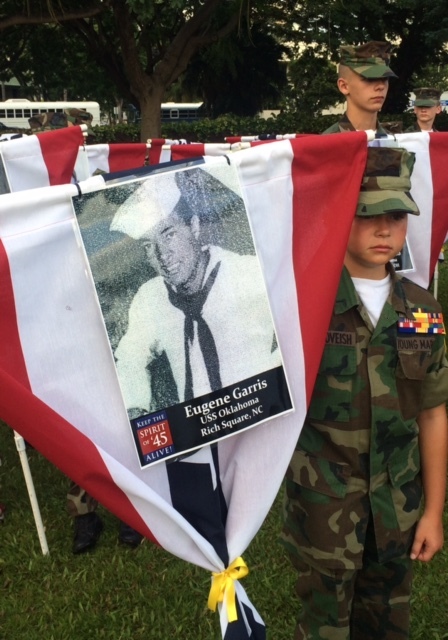 WWII heritage groups are creating a Wall of Honor that can be displayed during their 75th anniversary events and activities that will be taking place during the between now and 2020. 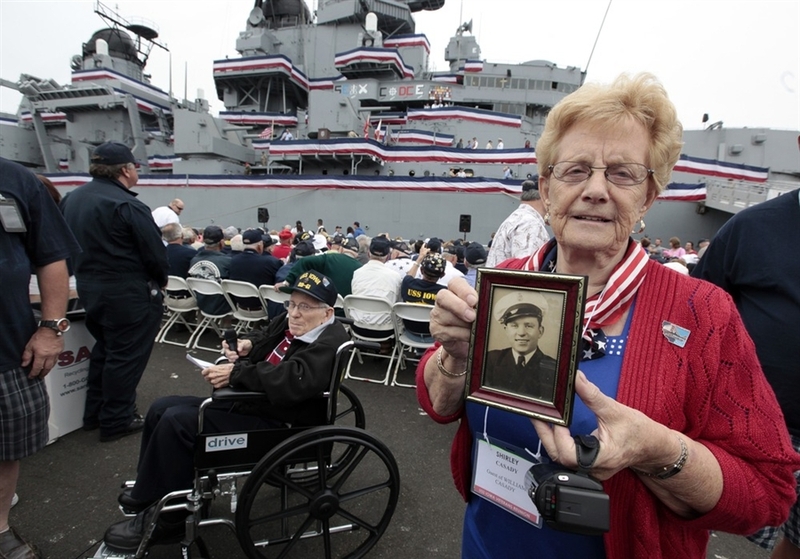 WWII vintage ships that will be commemorating the 75th anniversary of their commissioning are collecting the photos of their crews to create Wall of Honor displays of their crew members as a way to build closer connections with their families and the public. Pictured above is the Battleship USS Iowa Memorial berthed in San Pedro, CA. WWII Airpower Wall of Honor is 'under construction" to mark the 70th Anniversary of the founding of the United States Air Force on September 18, 1947. Among the photos that will be included will be those of Doolittle's Raid, which will be inducted into the Wall on the 75th anniversary of their historic bombing attack on Japan on April 18, 1942. For more details, please visit http://www.ww2airpowerwall.org or contact us at Info@Spiritof45.org. The original "Wall of Honor"
The original "Wall," which was 6 ft tall and more than 150 feet in length, included photos of US presidents John Kennedy and George H.W. Bush, all 464 WWII Medal of Honor recipients, Hollywood legends Jimmy Stewart, Clark Gable, Tony Curtis, Ernest Borgnine and Kirk Douglas, Major League Baseball standouts Jackie Robinson, Jerry Coleman, Bob Feller, Hank Greenberg, and Yogi Berra, and hundreds of less famous individuals whose photos were sent in from families around the country in 2011 and 2012. Read Washington Post coverage of unveiling of first "WWII Wall of Honor"
The photos of Senator Dan Inouye (Hawaii) and Senator Frank Lautenberg (New Jersey), the last two WWII veterans serving in Congress who joined Senator Susan Collins to co-sponsor Spirit of '45 Day when it was passed unanimously by the U.S. Congress in 2010, were the first to be placed in the Wall. Inouye received the Medal of Honor for bravery as a member of the legendary all Japanese American 442nd Battalion. Also included were the photos of all 464 Medal of Honor recipients, and 400 American soldiers, sailors, marines and merchant marines who lost their lives during the war, including those of the 87 Tuskegee Airmen who were KIA serving their country. San Jose's History Park's "Wall of Honor " displays 6 ft photos of local area WWII veterans from the San Francisco Bay Area. The Park's Wall will ultimately include more than 700 ft of photos, that will be displayed each year during the month of August and on Veterans Day in November. 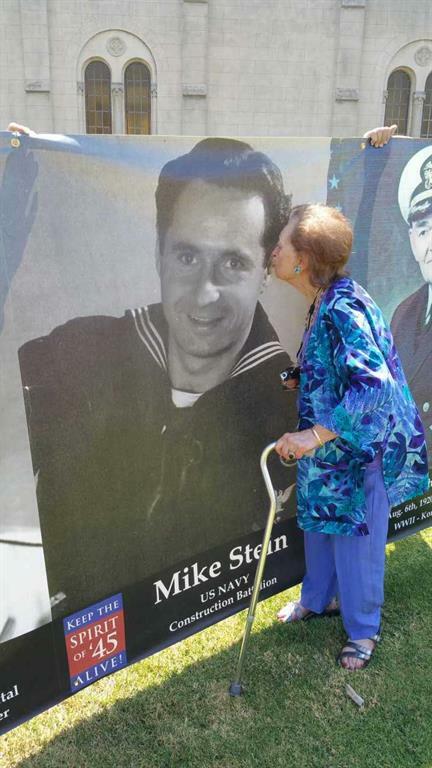 (R the widow of a WWII veteran gives her husband a loving kiss on Spirit of '45 Day.